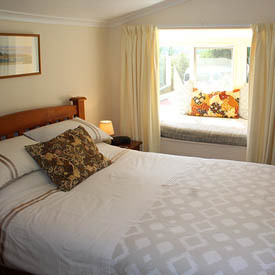 Look no further if you are seeking a cosy, relaxing Bed and Breakfast accommodation to rest up after a day’s travelling or activities. Indulge yourself at ‘Journeys End’ – listen to the birdsong chorus of bellbirds, silvereyes, california quail, tui and fantails; gaze upon the starlit skies free from city-light pollution; put your feet up on our beach-side deck; stroll along the water’s edge at low tide or enjoy a refreshing kayak or swim on the high tide. Here, nature’s beauty awaits your company, in happy contemplation or with camera or sketch-book in hand. We host only one guest-booking at a time, so you have your own bathroom/toilet and the choice of a double (queen-size) or twin-bedded room. Your own private entrance leads into a separate lounge area complete with tea and coffee making facilities, fridge and reading library for your use. Breakfasts are served downstairs or enjoyed in the outside patio, as preferred. Facing the sunny north and overlooking the sparkling tranquil waters of Mahakipawa Arm in the inner Pelorus Sound, 6 kms from Havelock, Journeys End is a haven of peace and calm – the perfect setting in which to unwind.